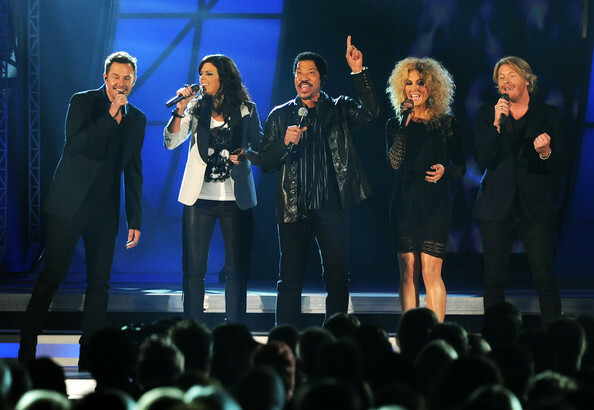 When Lionel Richie came out to sing with Little Big Town, I wasn't just distracted by the hair on that blonde chick..
Me: That guy looks like Bill Rancic. Where's Guiliana, Bill? Dave: Who the hell is Bill Rancic? Me: Really? You don't know who he is? Me: He won the first season of the Apprentice? Me: He's married to Guiliana from E News? Me: So you really thought that was him up there singing? Dave: How would I know? Me: Oh gosh... I knew I should have just tweeted that instead of said it out loud. Dave: Can we fast forward? 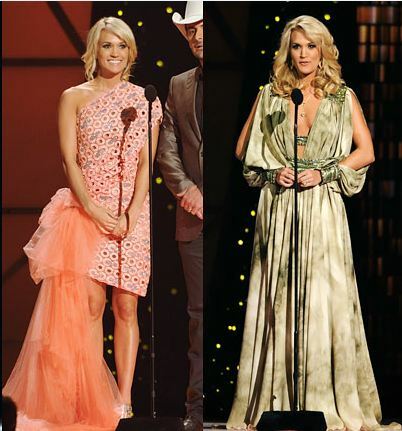 Not too long after that conversation..
Me: Oh no Carrie, that outfit is just as bad as the last one was. She should have had Rachel Zoe style her for this just like Anne Hathaway did for the Oscars. Dave: That'd be another good one for the twitter. just wanted to let you know that i gave you a bloggy award over on my blog. My husband is the same way... And totally agree about Rachel Zoe ! Hahaha. Just wanted to share that I LOL. And not in the text sense for a semi-funny comment that just warrants some recognition. But literally, LOL. Love it.